Stuffing so much food in that tiny deep freezer compartment of her refrigerator has always been a challenge and Mithila is finally determined to buy a separate deep freezer. She should be content with buying a medium, given her family of four. The interior is more or less similar regardless of the manufacturers. The compressor is most significant and a deep freezer's performance rests heavily on it. An easy and obvious way of finding a good compressor is to buy one of a reputed brand, maybe Singer or LG. But Mithila does not need to be too bothered as all the leading companies promise warranty of at least three years. She can rely on Singer. The one with the lowest capacity costs Tk 18, 800. If Mithila requires a bigger one, the deep freezer with the capacity of 142 litres costs Tk 20,800, while the one with 215 litres costs Tk 25,000. Sony Rangs is also reliable, but their deep freezers are typically bigger (and costlier) for Mithila's needs. The smallest one (245 litres), at Tk 23,900, will cost her more than what she plans to spend. The one that has the capacity of 262 litres costs Tk 25,900. If Mithila wants to stick to the budget or if possible lower the limit to some extent- she can look from showrooms of Konka, Hayes & Haier, and Walton. The latter is offering a deep freezer, called FC-105, of 145 litres that costs only Tk 16,490. Icon's BD-145 also has a deep freezer of the same capacity but the price is Tk 21,000. Meanwhile, Konka has three deep freezers, of capacities 110 litres, 150 litres and 200 litres, priced at Tk 17,000, Tk 19,000 and Tk 21,000 respectively. Hayes & Haier's BD-1528G may be okay for Mithila: its capacity is 150 litres and comes with a price of Tk 20,600. If she dislikes the design of typical chest freezers, she can go for GC-1545QAL. Available in LG Butterfly showrooms, this Korean model is able to hold 154 litres and costs Tk 21,290. The interior has got several compartments to store food. But if she holds on to the traditional design, these showrooms will offer her BD-145L for Tk 19,590. Exercising for ten minutes a day is enough to improve your health, and help you maintain a steady weight. Is that a possibility you might even wonder? Well, it is, even though most experts stubbornly insist that you need 30 to 60 minutes daily to see results. The case for shorter sessions has been building for some time, but earlier this year results from a watershed study made the point loud and clear- findings from a study involving 464 women who weren't exercisers. After six months, a group who walked an average of 72 minutes a week at two to three mph- that's about ten minutes of mall-pace striding a day-had significantly improved heart strength and general fitness, nearly matching the efforts of women exercising almost twice as long. "Your body responds very positively, very quickly to even small amounts of exercise. If you are sedentary, you will see a lot of your greatest gains going from zero to ten minutes a day", says experts. More exercise is definitely better, but based on another school of expert thoughts, there is evidence you can take your time easing into those longer workouts. A seven-week study of 22 couch potatoes found that those who did just one set of ten repetitions of seven strength-training moves (about ten minutes of lifting) three days a week gained as much strength as those who did a 30-minute, three-set routine. In a recent study of 48 men and women, spinning on a bike for ten minutes led to a mood lift and drop in depression and fatigue, similar to what they would get riding three times as long. After tracking nearly 4000 women in their 70s for three years, researchers found that those who reported often having arthritis pain needed only 75 minutes a week of moderate exercise like brisk walking to reduce the frequency of symptoms by nearly 30 percent. A large study of 13, 711 men and women reveal that just 70 to 75 minutes of brisk walking is enough to begin shrinking your waistline. And targeting your waist is important because belly fat is directly tied to heart disease, diabetes and early death. "We have seen significant changes in the autonomic nervous system, fewer incidences of the fight-or-flight stress reflex being triggered, with even 70 to 75 minutes a week of exercise," say experts. "A little exercise can do much more than people think, so there is no excuse for not getting up and just doing something." Warm a pot of water on the stove until just before boiling. Remove from heat and immerse noodles into it. Allow to sit while you prepare the other ingredients. Place 2-3 tbsp soy sauce in a cup (use 3 tbsp for 1½ cups sliced chicken, or 2 tbsp for 1 cup chicken). Add 2 tsp cornstarch and stir until the cornstarch dissolves. Now pour this mixture over the sliced chicken. Stir to combine. Allow the chicken to marinate in this mixture until ready to use. To make the Pad Thai sauce, start with the tamarind paste. Measure approximately 3/4 tbsp of this sticky black paste into a cup. Add 1/4 cup water and stir until the paste dissolves in the water (it helps if you use warm water). Now add 2 tbsp fish sauce, 1-3 tsp or more red chilli sauce, depending on how spicy you want it, and 2½ to 3 tbsp brown sugar. Set sauce near the stove for use later. Crack 2 eggs into a cup or bowl and stir enough to break the yolks. Set aside. Place a large (deep-sided) frying pan or wok over medium-high heat. When the wok/pan is hot, add 1-2 tbsp oil plus minced garlic (4 cloves). Stir-fry until fragrant (30 seconds to 1 minute). Now begin adding some of the chicken stock. Add only a few tablespoons at a time, enough to keep the chicken frying nicely. Keep stir-frying and adding stock until all the chicken stock (1/2 cup) is used up and chicken pieces/strips are cooked (about 5-8 minutes). Using a spatula or wooden spoon, push chicken to the outside of the wok or pan. Now add the egg, pouring it into the space you've made in the centre. Quickly stir-fry until egg is cooked. After frying the noodles in this way for 1-2 minutes, add the bean sprouts plus about 1/4 tsp freshly ground black pepper (sprinkle the black pepper over). Continue "tossing" for 1 more minute, or until noodles are done. 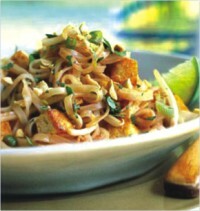 Lift noodles onto a serving plate. Top with generous amounts of fresh coriander, spring onion (green onion), and crushed or chopped nuts. The whistle of the train caught Faizul's attention. He had been busy handling his luggage for the past half hour. He looked at his mother; her swollen eyes broke his heart; she had been crying since morning. She had waited anxiously for his arrival a few days back but never thought of the departure. He had never had such a wonderful Eid in the past eight years. He awaited a long time to visit his beloved country, a long time to feel his mother's love, a long time to have the shemai he always wanted to taste during his days in London. The only thing that he was taking back was some beautiful memories captured in his camera and in his heart. Standing on the same platform, Zeba heard the whistle too. She was staring fixedly at the exit gate. She did not want to leave. It was a tough battle for her family to manage the tickets before the Eid, but their efforts bore fruit and she could come to her Nani Bari and meet her uncles and aunts together with a whole bunch of cousins. Her father only got three days of holiday from his office, and she was saddened by the thought of going back to her mechanical life. She saw her cousins bidding her goodbye and she could do nothing but sob. Rokon Talukdar was not carrying his usual load of trinkets to the train station. Today, he was a passenger like any other and not an uninvited hawker. He had a faint smile glued to his face. He had spent an amazing Eid with his family and two daughters after a whole year; the smiles on their faces were priceless. Eid was over, but the flavour of the season was not lost as yet. He looked at the train and with high hopes boarded the goods that might turn his fortune once again. He had already planned to save up for an outlet. Faizul, Zeba or Rokon never met, but their lives are not too different. While Faizul lives abroad, Zeba lives in considerable proximity to her close family, yet regardless of the real distance, both are isolated from their roots. Rokon takes the up train and comes back to Dhaka in the down; he is always in perpetual motion across the country. So close, yet so far from home. The binding of Eid that brings many a family together, sometimes once a year and sometimes even once in a decade is coupled with joy and its share of grey sadness. But that is life. As the train moves towards Dhaka, their lives will return to the mundane hustle and bustle of city life, be it in Dhaka or in London. Yet, the memories of Eid will forever be fresh and give them something to smile upon. While the earth is taking her diurnal motions, it is again time for season change. And as change of season approaches, changing wardrobe accordingly continues. While packing off your clothing, mothballs are compulsory to prevent them from dampness and stink. But as a substitute to mothballs, pieces of soap can also be used. Just take the leftover soap slivers and put them in a vented plastic bag. Fill the bag with seasonal clothes before packing them away. Not only will the scent prevent them from harm from moths, but also they'll smell great when ready for use.